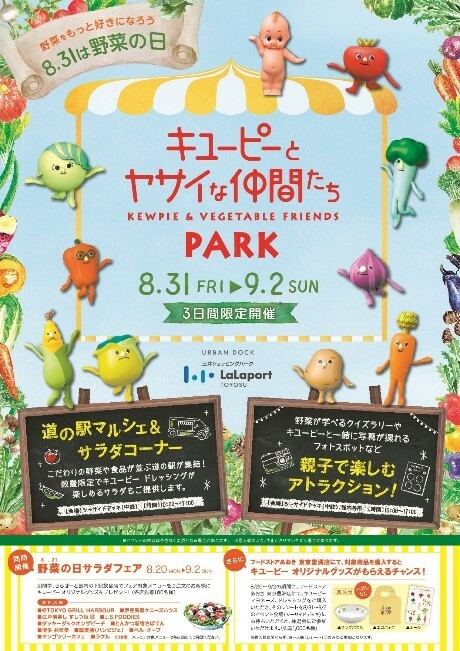 To celebrate “Vegetable Day” on August 31st, “Kewpie & Vegetable Friends Park” will be held from 8/31 (Fri) to 9/2 (Sun) at LaLaport’s Urban Dock in Toyosu. The concept is “enjoy vegetables”. There will be a market and salad corner, attractions for children, as well as activities at participating stores inside LaLaport. DIGI/TERAOKA will also be hosting a game, Gramme Contest, and will be providing the scales. Visitors can experience the fun of buying fresh foods by weighing them on a scale at the “Gramme Contest” station. Participants can win a prize by placing the correct daily value of vegetables (350g) on the scale. Scales are provided by Teraoka Seiko.